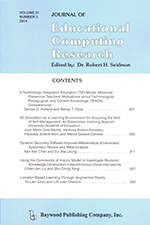 Acaba de publicarse en la revista internacional Journal of Educational Computing Research (JECR) nuestro último artículo relacionado con el uso de los entornos de simulación 3D para la adquisición de la competencia de autogestión. In this study we analyze how 57 Spanish university students of Education developed a learning process in a virtual world by conducting activities that involved the skill of self-management. The learning experience comprised a serious game designed in a 3D simulation environment. Descriptive statistics and non-parametric tests were used in the analytical process. An analytical rubric was taken as a reference to enable an expert observer to collect the relevant information. Our results show that the students generally achieved good levels of self-management in this technological environment. Senior university students presented higher scores than freshmen in this particular skill. We also found that students tended to develop better learning activities that involved analytical work than those that involved action or development. The students’ perceptions about 3D environments regarding self-management were mostly satisfactory, especially for planning activities. These results provide relevant information on how students develop activities that involve self-management components in a technological environment. However, the research design did not allow us to determine how this environment increases the level of this specific skill.